Jack grew up in Southern California and graduated from the US Naval Academy at Annapolis in 2007 with a BS in Political Science. 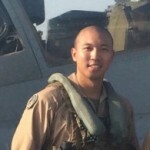 He commissioned into the Marine Corps and served as an AH-1W Super Cobra attack helicopter pilot, Aviation Safety Officer, and Weapons &amp;amp; Tactics Instructor. He deployed on the 13th Marine Expeditionary Unit to the Middle East, Operation Enduring Freedom, Afghanistan, and on the Unit Deployment Program to Okinawa, Japan and the western Pacific. He is a co-founder and Director of Operations for The Wingman Foundation, a non-profit dedicated to supporting the families affected by aviation mishaps and a proud partner of Service to School. Jack is transitioning from the Marine Corps in the summer of 2015 and will be pursuing an MBA from Columbia Business School.